Why on earth does iTunes sometimes change the tags of content in your library? Can you back up your iOS devices to a different folder than the default location? And if you accidentally delete all your movies, how can you get them back? Read on to discover the answers to these three questions. Why the heck are may tags changing? Q: I have a very specific way of tagging my music, and iTunes sometimes changes the tags of many of my songs back to the way they are in the iTunes Store. I’m not using iTunes Match, so why is iTunes changing my tags? I have received several emails about this issue; people are seeing tags they’ve changed revert to the way they were when they purchased music from the iTunes Store. This only happens for purchased music. It took a while to figure out what’s happening; it actually happened to me when setting up a new Mac recently. I’ve written up the explanation in some detail on my website, but here’s the short answer. 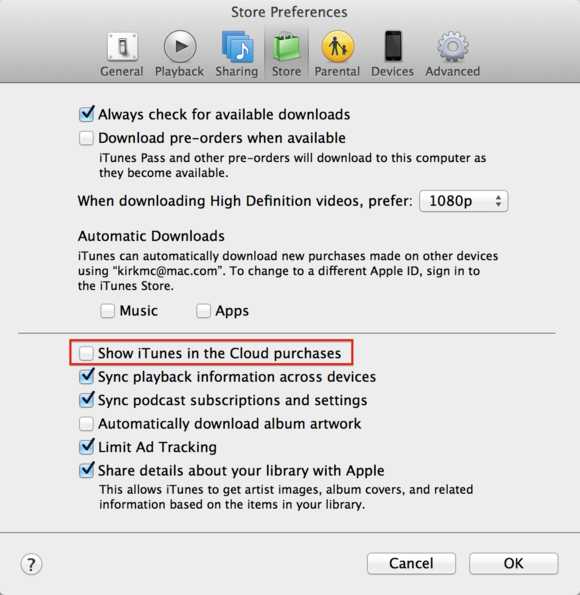 iTunes has an option in its Store preferences to show “iTunes in the Cloud” purchases. What this does is populate your iTunes library with all of the content you’ve purchased from the iTunes Store. If you check this option, iTunes may change the tags on your purchased content. Create a smart playlist with a condition that reads Kind contains Purchased. This will find all your purchased tracks, which are the ones whose tags will have been changed. Select all the tracks in that playlist, press Command-I, then change something. Find a tag you don’t use, and check it—you could use, for example, the BPM (beats per minute) tag, or the Comments tag. Click OK, and iTunes will change that tag, but also read the tags from your music files, reverting them to your customized tags. Some people have said that merely selecting tracks and pressing Command-I changed the tags back to the way they had them previously, but this didn’t work for me. So, unless you really want to use the iTunes in the Cloud feature, or don’t change tags on purchased content, don’t check that option. Q: I know I can have iTunes back up my iOS devices locally, instead of on iCloud. Where on my Mac are those backups located? I would like to back up my devices to an external hard drive instead of using the storage on my Mac mini. And they have names like 2e6841663f74a5z3d47p0baf56eacd7fb44197c3. You can find them by choosing iTunes > Preferences, then clicking Devices. Right-click any backup and choose Show in Finder. 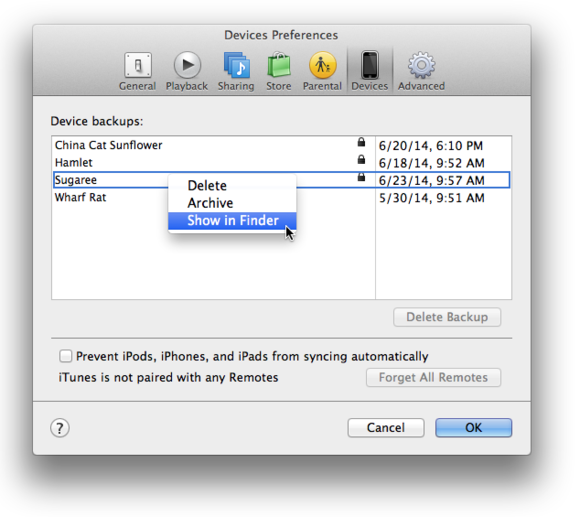 Find where iTunes stores backups of your iOS devices from iTunes’ preferences. The backups themselves aren’t very big. (I wrote about trimming iOS device backups in an article last year.) On my Mac, the backups for my four iOS devices take up less than 1 GB. In any case, you can’t choose the backup location; iTunes only backs up the files to the specific folder I mentioned above. What you might want to do, however, is look at your backups and see if there are any duplicates. Check the preference pane I show above. If you see more than one backup for any of your devices, you can delete the older ones. Right-click a backup and choose Delete. You probably only need to do this if you have several backups of any of your devices. I would expect iTunes to store only one backup for each device, but sometimes I see more than one. Also, if you haven’t cleaned out this list, there may be backups for devices you no longer own. Q: I recently deleted all my iTunes movies from my iMac by mistake. Is there a way to retrieve those movies so I can play them again on my computer or through my Apple TV? When I click on a movie, iTunes says file not found. However, on my iPhone or iPad I can still play the movies through the cloud. Fear not, they’re not lost forever. 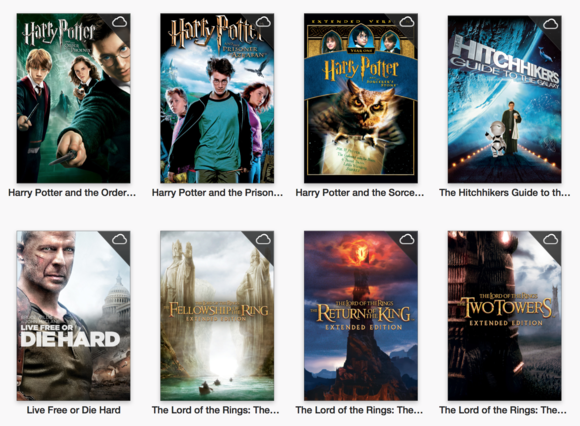 Since you can play them on your iPhone or iPad via the cloud, they’re movies you purchased from the iTunes Store. You can re-download all your iTunes Store purchases, as long as they’re still available. There are two ways to do this. I’d suggest you start by selecting all the movies in your iTunes library and deleting them first. Since the files are gone, this just deletes the entries in iTunes’ database. If you click the cloud icons on your movie icons, iTunes will download them. Option two is to go to the iTunes Store, click Purchased in the Quick Links section on the main page, and then click Movies. You’ll see similar cloud icons. Click them to download each movie. Note that it may take a long time to download all your movies, depending on how many you bought, and how fast your internet bandwidth is.